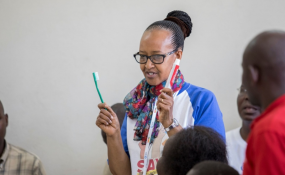 Kajiado — Unilever East Africa in partnership with the Kenya Dentists Association (KDA) joined the world in marking this year's World Oral Health Day today in Kajiado with calls on Kenyans to prioritise prevention over the treatment of oral diseases. The speakers led by KDA Chairman Dr Wetende Andrew urged Kenyans to brush their teeth at least twice a day-in the morning and before going to bed as a first line-defence against oral diseases, saying treating the diseases can be a big burden to families. During the function, Unilever announced that it had embarked on a programme to teach behavior change to school going children in order to instill and drive good oral hygiene habits early on in life. Under its sustainability agenda aimed at improving health, hygiene and enhancing livelihoods, the company made a big stride towards making oral care affordable and accessible to most Kenyans by launching Pepsodent toothpaste and toothbrush in retail outlets all over Kenya at an affordable price. "We have also issued 25 million worth of samples to schools in various towns all over Kenya in a bid to break barriers of awareness and access," said Beauty and Personal Care Director at Unilever East Africa, Mr. Pawan Marella. The WOHD is a global awareness campaign aimed at raising awareness on the importance of oral hygiene. Most Kenyans have never been assessed for oral diseases. This is because the country has a dentist population of about 1,000 for a population of 42 million people, giving a dentist-to-population ratio of 1:42,000. The World Health Organisation (WHO) recommends 1:7,000. The colourful ceremony, which was marked at Kajiado Township Primary School, also saw Unilever staff visit various other schools across Nairobi to conduct mass brushing sessions. Thousands were also screened for oral diseases. According to a global study commissioned by Unilever Oral Care through its toothpaste brand, Pepsodent, poor oral health not only damages children's teeth, it can also lower their self-esteem and harm their performance at school.